Ian and his family love to spend time at the family cottage enjoying the outdoors and life in nature. Ian has a passion for trees and producing quality work. 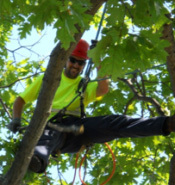 As a result, he still occasionally works at Kelly’s Tree Care part time to get away from the daily grind of hydro line clearance work at his current job.